Indacaterol/glycopyrronium (IND/GLY) 110/50 μg is a once-daily (o.d.) fixed-dose combination of long-acting β2-agonist/long-acting muscarinic antagonist approved in over 90 countries, including Ireland, for the management of COPD. The present study was conducted to evaluate health status of COPD patients, initiated on IND/GLY 110/50 μg o.d., using the Clinical COPD Questionnaire (CCQ) tool in a real-world primary care setting in Ireland. This was a real-world, prospective, open-label study. COPD patients aged > 40 years and with a smoking history of > 10 pack-years were included and switched to once-daily IND/GLY 110/50 μg. Enrolment of patients into the study occurred only after the decision had been made by the physician to prescribe IND/GLY 110/50 μg. Data were collected at baseline and Week 26. Health status was assessed using the validated CCQ. A total of 200 patients were included in study. The mean CCQ total score decreased from 2.36 at baseline to 1.44 at Week 26 (Δ, 0.92; P < 0.0005). Of the 156 patients who completed study, 113 (72.4%) achieved minimum clinically important difference in CCQ total score with IND/GLY 110/50 μg. CCQ domain scores also decreased during the study. Improvement in health status was observed across all GOLD groups and irrespective of prior COPD treatment. Adverse events were reported by 20% of patients with COPD exacerbation/infected COPD being the most common AE, reported by 11 patients. 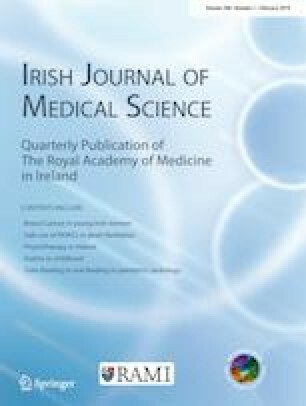 In real-life clinical practice in Ireland, IND/GLY 110/50 μg o.d. demonstrated statistically significant and clinically important improvement in health status in patients with COPD. The online version of this article ( https://doi.org/10.1007/s11845-019-02001-y) contains supplementary material, which is available to authorized users. Globally, the burden of chronic obstructive pulmonary disease (COPD) continues to increase, with an estimated prevalence of 251 million in 2016 . In 2015, COPD was the fourth leading cause of death and accounted for 5% of all deaths globally; by 2030, it is projected to become the third leading cause of death worldwide [1, 2, 3]. In Ireland, based on the 2011 census, nearly 500,000 people aged ≥ 40 years had COPD; over 200,000 have moderate or severe disease and only half are likely to be diagnosed . The assessment of COPD severity has been traditionally based on the evaluation of lung function, but this alone does not provide a complete estimate of the impact of disease . In COPD, health status is considered to be an important outcome that reflects functional effects of the disease as perceived by the patients . From 2011, the Global Initiative for Chronic Obstructive Lung Disease (GOLD) also recommended COPD management based on symptoms or health status assessment and lung function parameters . GOLD recommends the use of validated questionnaires such as the Clinical COPD Questionnaire (CCQ), COPD Assessment Test (CAT) or St. George’s Respiratory Questionnaire (SGRQ) for the assessment of health status and symptom impact . Whilst SGRQ is the most frequently used questionnaire to evaluate health status of COPD patients in clinical trials, its use is limited in routine clinical practice because it is long and complex to administer and calculate the scores . GOLD 2018, therefore, recommends use of the more practical CCQ and CAT scores in clinical practice . CCQ is a short (10-item), easy-to-complete, well-validated, self-administered health status questionnaire for COPD consisting of three domains: symptoms, functional status and mental state . It is ranked first on the International Primary Care Respiratory Group (IPCRG) ranking as the most appropriate tool for assessing health status in primary care, ahead of CAT, SGRQ and modified Medical Research Council (mMRC) scale . Indacaterol/glycopyrronium (IND/GLY) 110/50 μg is a once-daily (o.d.) fixed-dose combination of long-acting β2-agonist/long-acting muscarinic antagonist (LABA/LAMA) approved in over 90 countries, including Ireland, for the management of COPD . Much evidence is available for the efficacy and safety of IND/GLY 110/50 μg o.d. from the IGNITE clinical trial program, including data on improvement in health status . Although, medical evidence from randomised controlled trials (RCTs) is robust, the evidence of effectiveness in clinical practice is limited. To date, there is no evidence on the effectiveness of IND/GLY 110/50 μg o.d. on Irish patients in a real-world setting. 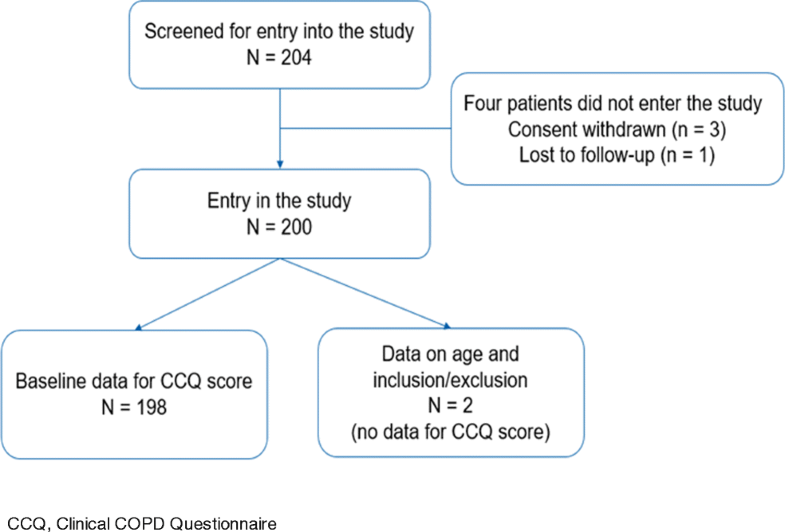 The present study was conducted to evaluate health status of COPD patients, initiated on IND/GLY 110/50 μg o.d., using the CCQ tool in a real-world primary care setting in Ireland. The study also aimed to provide data on clinical characteristics of patients, who were considered appropriate by physicians for initiation of dual bronchodilator therapy. This was a real-world, prospective, open-label, multicentre, non-randomised, non-interventional study in Irish patients. Enrolment of patients into the study occurred only after the decision had been made by the physician to prescribe IND/GLY 110/50 μg; this ensured that the choice of treatment was not influenced by the patient’s participation in the study. Physicians prescribed IND/GLY 110/50 μg o.d. according to the Irish Summary of Product Characteristics, regardless of prior therapy for COPD. All patients signed the informed consent before any data were captured. The CCQ was completed by each patient and electronic case report form (eCRF) was completed by the investigator. Data were collected at two time points, Day 0 and Week 26; at baseline, information on patient demographics, COPD disease characteristics, medical history and concomitant medications was recorded. Baseline measurements of health status were also captured from the patients completing CCQ during the first visit, i.e. prior to patients commencing their first dose of IND/GLY. The second visit occurred 6 months after the first, during which time health status measurements using the CCQ, adverse events (AEs) and serious AEs (SAEs) experienced during the study, and reasons for discontinuation of IND/GLY, were captured. The study was compliant with Good Pharmacoepidemiology Practice (Fig. 1). Adult patients aged > 40 years with a spirometric diagnosis of COPD (post-bronchodilator forced expiratory volume in 1 s [FEV1]/forced vital capacity [FVC] < 0.70) and a smoking history of > 10 pack-years were included. Patients were excluded if they had a previous or current diagnosis of asthma or known sensitivity to the active ingredients or any excipients in IND/GLY 110/50 μg dosage form. Patients with cardiac or respiratory disease unrelated to COPD were also excluded if the risk outweighed the benefit for the patient as per investigator’s discretion. At all sites, the investigator was responsible to maintain source documents for each patient in the study. Before the study was initiated, the site investigators and their staff were given training on the operational details of the study protocol and the eCRF. CCQs were completed by the patients at the start of the study, before commencing treatment with IND/GLY 110/50 μg and after 26 weeks of treatment. The CCQs were collected and entered into the eCRF by the investigators. Patient demographics, baseline characteristics, study medication, prior and concomitant medication and treatment discontinuation evaluation data were obtained from the clinical case notes. Safety data were transferred electronically to the study sponsor on a weekly basis. All clinical data were transferred to the sponsor at the end of the study. The primary endpoint was to assess the effectiveness of IND/GLY 110/50 μg on the patient’s health status as measured by change from baseline in the CCQ after 26 weeks of treatment. The proportion of patients achieving minimal clinically important difference (MCID) of > 0.4 units from baseline in total CCQ score (CCQ responders) was also assessed. The secondary endpoints were to describe demographic details and clinical characteristics of COPD patients who were prescribed IND/GLY 110/50 μg, in terms of lung function (FEV1, FVC, FEV1/FVC), exacerbation history, smoking history, combined COPD assessment as per GOLD 2014 and baseline health status data using the CCQ. Correlation of lung function outcomes and exacerbation history at baseline and the health status of patients was also assessed. A key secondary endpoint was to evaluate the trend in CCQ scores and responders on switch to IND/GLY from previous COPD treatments (LABA, LAMA, LABA/inhaled corticosteroid [ICS] fixed-dose combination, LABA-LAMA (free- or fixed-dose combinations), short-acting beta-agonist [SABA], short-acting muscarinic antagonist [SAMA], SABA/SAMA, theophylline). Whilst treatment switch from ICS-based triple therapy (LABA/ICS + LAMA) to IND/GLY was not included as a pre-defined endpoint, relevant data were collected. Safety assessments in terms of AEs and SAEs, and discontinuation of IND/GLY 110/50 μg within the first 6 months of initiation (if applicable), were also evaluated as secondary endpoints. All analyses were done descriptively. No confirmatory statistical testing was applied. A sample size of 245 patients with COPD was targeted to be recruited from approximately 20 to 25 centres. As the study aim was descriptive, the sample size was based on the width of two-sided 95% confidence interval (CI) around the mean change from baseline in CCQ score. To achieve the appropriate level of precision of 95% CI width of 0.3 (± 0.15), a total of 171 evaluable patients were required. Assuming a dropout rate of 30%, a total of 245 patients were planned to be included. The primary endpoint was the evaluation of change from baseline in the CCQ score after 26 weeks of treatment. Patients completing both visits were included for CCQ assessment. Two-sided CIs are displayed for important results (at 5% level of significance). CCQ responders were defined as patients who achieved the proposed MCID of ≥ 0.4 units from baseline in total CCQ scores. Other categorical parameters like lung function outcomes, exacerbation history and drug prescribed prior to enrolment and demographic data (e.g. gender, race, smoking status) were summarised appropriately using absolute numbers and percentages. Numerical data (number of available data, mean, standard deviation, minimum, median, maximum, lower and upper quartile) was summarised using standard statistical terms. The overall incidences of treatment-related AEs, their relationship to the study, actions taken, outcome and SAEs were summarised using cross-tabulations (i.e. highlighting the relationship/pattern between AEs). Missing data were not replaced. Of the 204 patients who were screened, 200 met the inclusion criteria and were duly entered into the study (Fig. 2). The CCQ cohort includes all patients who completed a baseline and a follow-up CCQ at Week 26. At baseline, 198 patients completed the CCQ, and at Week 26, 156 patients completed the CCQ assessment and were deemed eligible for inclusion in the CCQ cohort. Of these, 146 patients completed the study and 10 patients withdrew the treatment but completed the Week 26 CCQ assessment. The CCQ cohort was used for generating the paired CCQ data in this study. Patient demographics and baseline characteristics are listed in Table 1. Most patients had moderate airflow limitation (48.2%), as reported by the physicians, and the mean rate of exacerbations in the year prior to enrolment was 1.99. The mean CCQ total score was 2.42 (n = 198) at baseline, which decreased significantly by 40% to 1.44 (n = 156) at Week 26. In patients with paired CCQ data (n = 156), there was a significant decrease of 39% in the mean CCQ total score (0.92) between baseline and Week 26 (Fig. 3). The decrease in the CCQ total scores in the overall and CCQ cohorts was statistically different from the MCID (P < 0.0005 for both cohorts). A mean CCQ total score > 5 was recorded for two (1.0%) patients at baseline, which decreased to 0 (0%) patient at Week 26. Twenty-four (12.1%) patients had a mean CCQ total score ≤ 1 at baseline and this number increased to 73 (46.8%) patients at Week 26. Of the 156 patients who completed Week 26, 113 (72.4%; 95% CI, 64.7% to 79.3%) patients achieved the proposed MCID of ≥ 0.4 units from baseline in the mean CCQ total score with IND/GLY in the mean CCQ total score and were classified as CCQ responders. CCQ domain (symptom, functional state and mental state) scores, evaluated in the CCQ cohort (n = 156), decreased from baseline to Week 26 (Table 2). The mean change in the CCQ score for symptoms, functional state and mental state was found to be significantly correlated with the decrease in the mean CCQ total score. There was a decrease in the mean CCQ total score in patients who were previously on other COPD treatments, namely, LABA only, LABA/ICS only, LAMA only or LABA-LAMA only prior to switching to IND/GLY. A decrease in the mean CCQ total score was also observed in patients who switched from ICS-containing triple therapy to IND/GLY (Table 3). In the CCQ cohort, 82 patients were classified as CCQ responders at baseline which increased to 113 patients at Week 26 (Δ, + 31 patients). The odds ratio of having a particular treatment for CCQ responders versus CCQ non-responders is described in Table S1. The overall CCQ score in men decreased from 2.40 at baseline to 1.52 at Week 26. Similarly, the overall CCQ score in women decreased from 2.44 at baseline to 1.35 at Week 26. Twelve (11.8%) men and an equal number of women (12.5%) had a mean CCQ total score ≤ 1 at baseline and these numbers increased to 35 (42.7%) for men and 38 (51.4%) for women at Week 26. FEV1 and FVC measurements at baseline did not correlate with the baseline CCQ scores (P = 0.54 and 0.52, respectively); similarly, FEV1/FVC ratio did not correlate with the difference in mean CCQ total score at baseline (P = 0.98) and Week 26 (P = 0.74). The correlation between mean number of exacerbations and CCQ score is described in Table S2. No statistical correlation was observed between the number of exacerbations in the last 12 months and difference in the CCQ total score at Week 26. However, improvement in the CCQ score was observed during the study period, regardless of the exacerbation history. CCQ total scores were collected at baseline and Week 26 for patients categorised in GOLD groups A–D (Table 4). There was a decrease in the CCQ total score at Week 26 compared with baseline for all GOLD groups. A total of 57 patients discontinued IND/GLY 110/50 μg during the study. Patient decision was the main reason for discontinuation (n = 24), followed by lack of efficacy (n = 9), adverse event (n = 5), other reasons (n = 5) and doctor’s decision to withdraw (n = 3). No data were available for remaining 11 patients. AEs were reported by 40 (20%) patients, with COPD exacerbation/infected COPD being the most common AE (n = 14), reported by 11 patients. Concomitant medication was required on 13 of the 14 occasions that COPD exacerbation/infected COPD were reported (in occasions unrelated to the IND/GLY); at one instance, IND/GLY was discontinued (occasion deemed unlikely to be caused by IND/GLY). 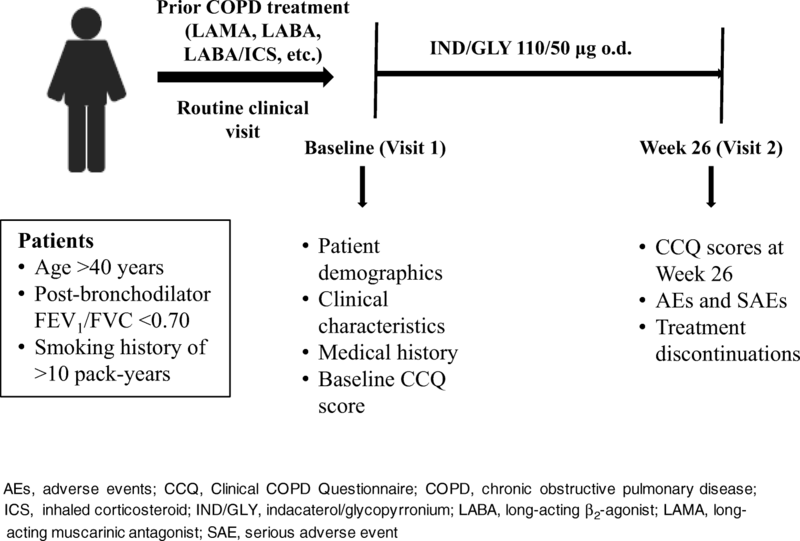 Of the patients experiencing COPD exacerbations, one patient (GOLD group C) was on ICS-containing treatment (LABA/ICS) at baseline and was switched to IND/GLY. A total of seven AEs were deemed as being probably drug related; this included blurred vision, breathing worsening, dry cough, general feeling of un-wellness, rash, sore throat and swelling of the inside mouth. No adverse events were ‘definitely’ caused by the study drug. A total of seven SAEs were reported in six patients; these included hospitalisation due to COPD deep venous thrombosis and femur fracture (n = 2), COPD exacerbation/infected COPD (n = 2), myocardial infarction (n = 1), pulmonary embolism (n = 1) and death due to unrelated issues (n = 1). Three deaths were reported—each due to myocardial infarction, unrelated cause and pulmonary embolism; the causes of death were unrelated to IND/GLY. To the best of our knowledge, this is the first study to evaluate, using the CCQ tool, the health status in COPD patients who were initiated on or switched to IND/GLY 110/50 μg, in a real-world primary care setting in Ireland. We calculated that a total of 171 evaluable patients were required to achieve a difference of 0.3 in mean CCQ scores from baseline, based on an 80% statistical power and 5% level of significance. The resulting sample size at Week 26 was lower (n = 156) than the required sample size, but the difference observed in mean CCQ scores was higher than expected, and hence, the power of the result as observed from difference from zero and MCID was 100.00% and 99.99%. 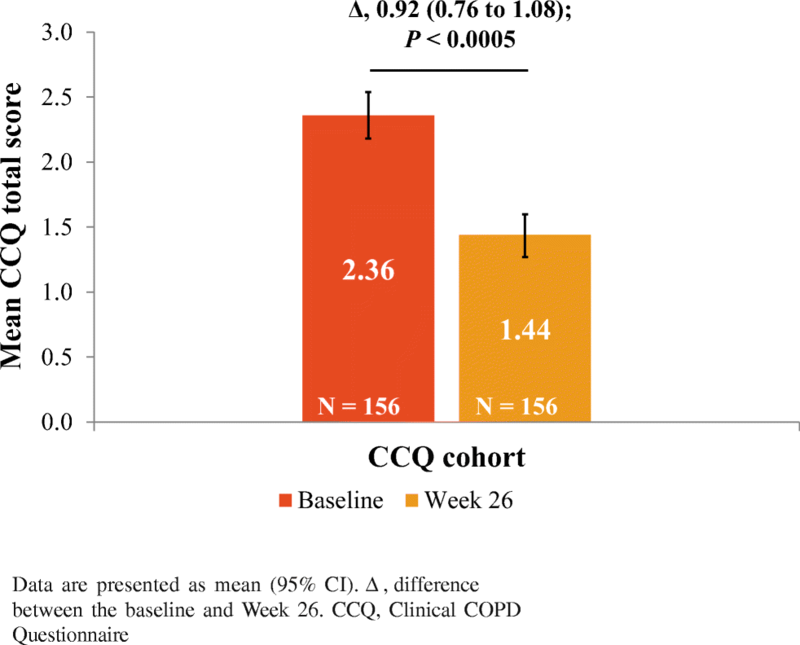 The study met its primary objective, with a significant decrease (overall cohort, 40%; CCQ cohort, 39%) in the mean CCQ total score from baseline at Week 26, demonstrating effectiveness of IND/GLY 110/50 μg in improving health status in COPD patients. The number of CCQ responders with IND/GLY 110/50 μg was also high in the study. Improvement in health status was comparable across both genders. A decrease in mean CCQ total score correlated with the decrease in CCQ symptoms, functional state and mental scores, observed during the study. The efficacy and safety of IND/GLY have been well established in several robustly designed clinical trials; however, real-world evidence is limited. CRYSTAL was a 12-week open-label pragmatic study that evaluated the efficacy and safety of a direct switch from previous treatments to IND/GLY in patients with moderate COPD and a history of up to one exacerbation in the previous year . In the present study, patients were enrolled only after the decision had been made by the physicians to prescribe IND/GLY 110/50 μg, which allowed for either direct switch to IND/GLY 110/50 μg from previous COPD treatments or initiation of treatment with IND/GLY. 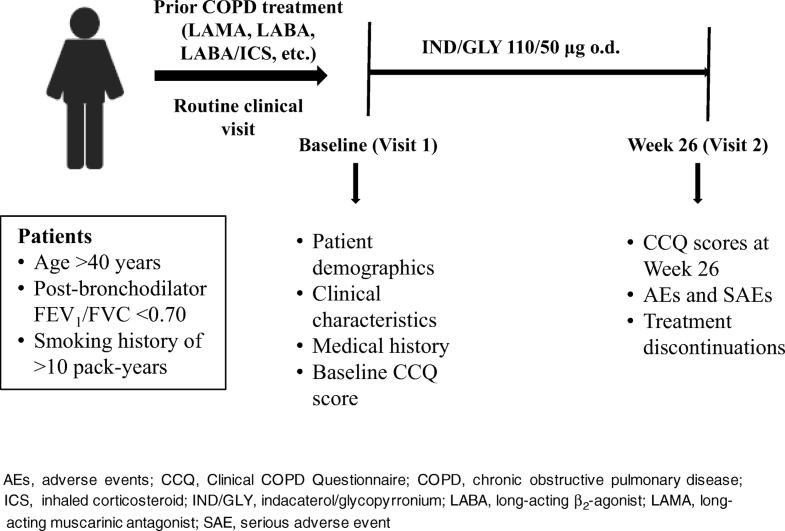 Improvement in health status with IND/GLY 110/50 μg was independent of the prior treatment as reflected by decrease in the CCQ score from prior COPD treatments, namely LABA, LABA/ICS, LAMA or LABA-LAMA at Week 26. These results are in line with those from the CRYSTAL study, which showed improvements in health status with IND/GLY, as evident from a decrease in CCQ total score, on direct switch from LABA + ICS (Δ = − 0.2; P < 0.05) and LABA or LAMA (Δ = − 0.3; P < 0.001) to IND/GLY . Together, results from both studies highlight greater improvements with IND/GLY in the health status of COPD, compared with other treatments, in a real-life setting. Results from the QUANTIFY trial showed that IND/GLY was non-inferior to the standard-of-care, free-dose LABA-LAMA combination of TIO 18 μg o.d. + formoterol 12 μg b.i.d. in terms of improvement in health-related quality of life and showed that an efficacy gradient (though small) exists within the same drug class, when delivered as different dosage forms (fixed- versus free-dose combination) . Results from our study are in line with the above-published article. In our study, improvement in health status with IND/GLY (fixed-dose combination) was observed in patients who were previously treated with LABA-LAMA (free- or fixed-dose combinations), which highlights the efficacy difference between IND/GLY and other LABA-LAMA (free- or fixed-dose combinations). These results, however, are based on a very small number of patients (n = 19) and should be interpreted with care. It has also been established through clinical trials that an efficacy gradient exists even between different LABA/LAMA fixed-dose combinations [14, 15]. Feldman et al. were the first to conduct a direct comparison study of two once-daily fixed-dose LAMA/LABA combinations, umeclidinium/vilanterol 62.5/25 μg o.d. (UMEC/VI) and tiotropium/olodaterol (TIO/OLO) 5/5 μg o.d. in patients with symptomatic COPD. UMEC/VI demonstrated superior lung function improvement (FEV1 at Week 8) compared with TIO/OLO. These results confirm that not all fixed-dose LABA/LAMA combinations have similar efficacy in patients with COPD . In our study, improvement in health status was observed in patients who were switched from ICS-containing regimen (LABA/ICS and LABA/ICS + LAMA) to non-ICS-containing regimen (IND/GLY). These findings are supported by the evidence from several clinical trials. The CRYSTAL study results showed that in mildly symptomatic COPD patients, the switch from a mono-bronchodilator regimen (with or without ICS) to a dual bronchodilator (IND/GLY) significantly improved lung function, breathlessness and overall quality of life . The WISDOM trial also demonstrated that in patients with severe COPD receiving triple therapy (TIO + salmeterol + fluticasone), the risk of moderate or severe exacerbations was similar among those who discontinued ICS versus those who did not . A 1-year follow-up data from the real-life DACCORD study in a subgroup of patients with COPD who discontinued ICS-containing therapy at study entry and were initiated on a LABA/LAMA FDC-based therapy showed that the ICS withdrawal subgroup had a relatively low risk of exacerbations and was associated with an improvement of health status in over 60% of patients . Results from this real-life study also showed that fewer patients receiving dual bronchodilator (15.5%) experienced exacerbations compared with those receiving triple therapy containing ICS (26.6%; P < 0.001) with greater improvements in health status over 1 year (mean change from baseline in the CAT total score, − 2.9 versus − 1.4; P < 0.001) . One of the secondary endpoints of the study was to collect patient data, in terms of clinical characteristics, that can indicate the disease stage at which primary care physicians can initiate dual bronchodilator therapy. The mean number of COPD exacerbations in the last 12 months was 1.99, with 42% patients reporting zero to one exacerbation. Most patients were categorised in GOLD group B (48.2%), followed by groups A (27.2%), C (20.0%) and D (4.6%) at study entry by the physicians. Patients in GOLD groups A and C are less symptomatic; however, in this study, the mean CCQ total score in GOLD group C patients was 2.72 and 1.59 at baseline and Week 26, respectively, which was comparable with GOLD group B and D (high symptom groups) patients. The results are discordant considering the history of exacerbations and mean CCQ scores in these patients and highlight potential non-adherence to GOLD recommendations. GOLD 2014, applicable at the time of study initiation, recommended the use of LABA-LAMA as an alternative choice for COPD patients in GOLD groups B, C and D . Whilst a large proportion of patients in the present study were categorised in GOLD groups B, C and D, and received appropriate treatment with IND/GLY (a LABA/LAMA), it should also be noted that patients in group A were also prescribed IND/GLY, which was not recommended by GOLD for this group of patients. As expected, FEV1 and FVC measurements at baseline did not correlate with the baseline CCQ scores. Similarly, the FEV1/FVC ratio from baseline was not found to be correlated with the difference in CCQ scores at Week 26. Furthermore, there was no statistical correlation between the number of exacerbations in the last 12 months and CCQ score differences at Week 26. These results showed that improvement in health status with IND/GLY 110/50 μg was independent of the baseline lung function and exacerbation history. Of the 198 patients analysed, 57 stopped using IND/GLY before Week 26, 46 had a reason and no data were collected for the other 11 patients. Most discontinuations (52.2%) were due to the patient’s own decision; other reasons included lack of efficacy (19.6%) and doctor’s decision (6.5%), with only 10.9% of discontinuations occurring due to AEs. A large proportion of patients discontinued from study sites 9 (n = 12), 10 (n = 6) and 27 (n = 9). It was not possible to identify any trend by disease status at baseline or any other demographic or medical history parameter that might explain or clarify the extent of patient withdrawal in this study. Most of the missing CCQ data at Week 26 were reported in patients who discontinued IND/GLY 110/50 μg (36/46) compared with only a single instance of a missing CCQ in those patients who did not; this should be considered while evaluating the significant improvement in CCQ during the study period. The overall safety profile was found to be acceptable and in line with that observed in IND/GLY clinical trials . COPD exacerbation/infected COPD was the most commonly reported AE; none of the AEs were ‘definitely’ related to the study drug. A total of seven SAEs were reported during the study. Three deaths were reported during the study, which were found to be unrelated to the use of IND/GLY 110/50 μg. The study has certain limitations. Whilst assessing the significance of these findings, the absence of a completed CCQ at Week 26 for approximately 25% of the patients should be considered. The percent predicted FEV1 values were not calculated during the study and categorisation of patients in GOLD groups by physicians was done without considering this parameter. GOLD 2014, applicable at the time of study, recommended the use of percent predicted FEV1 values for combined COPD assessment. However, it should be noted that with updates to the GOLD strategy in 2018, the percent predicted FEV1 are no longer recommended for categorisation of patients in GOLD groups. The patients included were those deemed appropriate for treatment with LABA/LAMA, which according to GOLD 2014 (applicable at the time of study) were GOLD group B, C and D patients. However, the majority of the patients included in this study were categorised as GOLD group B by physicians, which may be considered as potential selection bias. In this study, GOLD categorisation was done solely based on physicians’ judgement, which can be a potential limitation of the study. However, it should also be understood that this may indicate the real-world practice in primary care wherein applicability of GOLD recommendations may be a challenge. Data on inhaler technique trainings was not captured for the study purpose. Patients with cardiac or respiratory disease unrelated to COPD were excluded as per investigator’s discretion, which might be considered as potential selection bias. In real-life clinical practice in Ireland, once-daily IND/GLY 110/50 μg demonstrated a statistically significant and clinically important improvement in health status and was consistent across various subgroup analyses regardless of the previous COPD therapy. The study also highlighted the need for greater physician education in the primary care setting to ensure adherence to GOLD recommendations for driving appropriate COPD management. The study was funded by Novartis Ireland Limited. The authors were assisted in preparation of manuscript by Vatsal Vithlani and Nupur Chaubey, professional medical writers from Novartis. The article was prepared in accordance with the third edition of Good Publication Practice guidelines. Initial data were presented at the ITS Scientific Meeting, November 23–24, Belfast, Ireland. All authors contributed to the concept and design of study and agree to be accountable for all aspect of this work. The authors contributed to the preparation of the manuscript draft, critical review and approval of manuscript for submission to the journal. Brian O’Doherty, Jane Dorman, Karen McGrath, Kevin Kelly and David Molony were involved in conduct of study and Seán Lacey provided statistical service. Sarah Whelan, Simon Schmid and Shane Sullivan are employees of Novartis. Authors have no potential conflict of interest to declare. The authors received no compensation related to the development of the manuscript.